A blue-eyed white Oriental Shorthair kitten. The line of the nose, eyes, and middle of the ear form a triangular wedge. The Oriental Shorthair is a member of the Himalayan family of breeds, and can be found in various solid colors, and patterns such as smoke, shaded, parti-color/tortoiseshell, tabby and bicolor (any of the above, with white). Not all variants are acceptable to all organizations that recognize the breed. Conforming Oriental Shorthairs, like any of the Himalayan type, have almond-shaped eyes and a wedge-shaped head with large ears. Their bodies are typically "sleek" but muscular. The long-haired version of the breed, the Oriental Longhair (recognized since 1995 by CFA), simply carries a pair of the recessive long hair genes. Solid : The coat color is uniform across the entire cat. Each hair shaft should be the same color from root to tip, and be free of banding and tipping. CFA-acceptable colors for this breed are red, cream, ebony, blue, lavender, cinnamon, fawn and white. The corresponding GCCF colors are (respectively) red, cream, brown, blue, lilac, chocolate and apricot (white is not permitted as the base color in GCCF, and WCF does not permit white at all). Shaded pattern: Will have a white undercoat with only the tips being colored CFA and GCCF recognize this. Other breed registries call this the chinchilla pattern. Smoke pattern: The hair shaft will have a narrow band of white at the base which can only be seen when the hair is parted. This white undercoat to any of the above solid colors (except white, of course) is provided by an interaction of two different genes. CFA and GCCF recognize this. Parti-color: Has patches of red and/or cream, which may be well-defined blotches of color, or marbled. This color pattern is referred to as tortoiseshell (or "tortie" for short) in non-pedigreed cats by CFA, and this alternative term is used by GCCF and organizations for pedigreed cats as well. 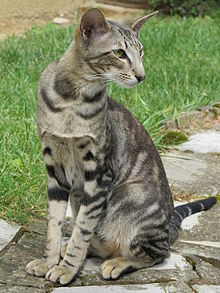 Tabby coat pattern: Recognized by GCCF and CFA. Each hair shaft should have a band of color around the middle of the hair shaft. GCCF recognizes four variants of tabby: classic, mackerel, spotted and ticked. Bicolor pattern: Recognized by GCCF and CFA. The bicolor pattern is created by the addition of a white spotting gene to any of the other accepted colors/patterns. The cat will have white on its belly, on the legs/paws, and in an inverted "V" on the face. WCF does not permit this variant, as it is opposed to white in this breed. In scientific illustrator Jenny Parks' 2017 book Star Trek Cats, Star Trek's Spock is depicted as an Oriental Shorthair. In Joann Sfar's Le Chat du Rabbin (The Rabbi's Cat), the eponymous cat has the physical features of an Oriental Shorthair. Wikimedia Commons has media related to Oriental Shorthair. ^ "ORIENTAL SHORTHAIR". The International Cat Association. ^ a b c d e f g h i j k l m n o p Agresta, Bob; Kultala, Joann (July 27, 2010). "Oriental Breed Profile". CFAInc.org. Cat Fanciers' Association. Archived from the original on October 29, 2012. Retrieved December 29, 2012. ^ a b c d e f g h GCCF Oriental Joint Breed Advisory Committee (2006). "GCCF Standards of Points for Oriental Shorthairs". Oriental Cats in the U.K. Bridgwater, Somerset, UK: Governing Council of the Cat Fancy. Archived from the original on December 26, 2008. Retrieved December 30, 2012. ^ a b c d "Recognised Breeds and Registration Policies". GCCFCats.org. Governing Council of the Cat Fancy. 2012. Retrieved December 30, 2012. ^ "Information Regarding the Oriental Shorthair Cat". Cuddly Kittens. October 16, 2011. Retrieved February 4, 2012. ^ Association, Cat Fanciers. "Breed Profile: The Oriental". Cfa.org. Retrieved 15 December 2017. ^ a b c "Oriental Shorthair". WCF-Online.de. Essen, Germany: World Cat Federation. January 1, 2010. Retrieved December 30, 2012.